In this published M-file we will try to present some of the central ideas involved in doing calculus with MATLAB. The central concept is that of a function. We will discuss first the representation of functions and then the ways of accomplishing the things we want to do with them. These fall into three broad categories: symbolic computation, numerical computation, and plotting, and we will deal with each of them in turn. We will try to provide concrete illustrations of each of the concepts involved as we go along. For the present, we will confine ourselves to functions of one variable. Later, we will need to discuss MATLAB's routines for dealing with functions of several variables. as inline functions (not especially recommended). The next lines will show that we can differentiate f, but we cannot evaluate it, at least in the obvious way, since f(4) will give an error message (try it!). Notice that MATLAB recognizes what the "variable" is. In the case of several symbolic variables, we can specify the one with respect to which we want to differentiate. What is going on here is that the x in f gets replaced by whatever the argument to the function is. Here the matlab function char replaces its argument by the string that represents it, thereby making it available to functions such as inline that demand strings as input. The other way to create a function that can be evaluated is to write a function M-file. This is the primary way to define a function in most applications of MATLAB, although we shall be using it relatively seldom. The M-file can be created with the edit command, and you can print out its contents with the type command. a) Enter the formula for g(x) as a symbolic expression. b) Obtain and name a symbolic expression for g'(x). c) Evaluate g(4) and g'(4), using subs. d) Evaluate g(4) and g'(4), by creating anonymous functions. e) Evaluate g(4) by creating an M-file. One of the things we might want to do with a function is plot its graph. 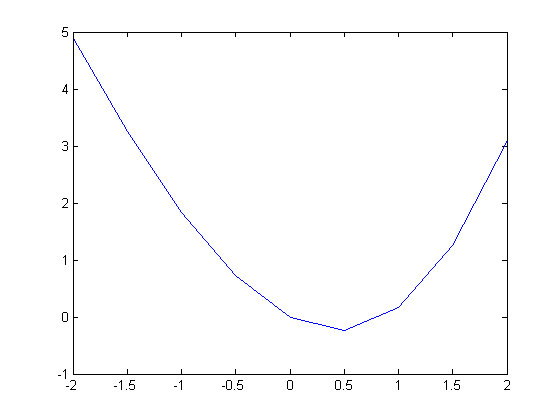 MATLAB's most elementary operation is to plot a point with specified coordinates. X1 is now a vector of nine components, starting with -2 and proceeding by increments of .5 to 2. Generally speaking, any command such as the one above creating a long vector should be terminated by a semicolon, to suppress the annoying written output. We must now prepare an input vector of y-coordinates by applying our function to the x-coordinates. Our function fin will accomplish this, provided that "vectorize" it, i.e., we redefine it to be able to operate on vectors. The matlab function vectorize replaces , ^, and / by ., .^, and ./ respectively. The significance of this is that MATLAB works primarily with vectors and matrices, and its default interpretation of multiplication, division, and exponentiation is as matrix operations. The dot before the operation indicates that it is to be performed entry by entry, even on matrices, which must therefore be the same shape. There is no difference between the dotted and undotted operations for numbers. However vectorized expressions are not interpreted as symbolic, in the sense that they cannot usually be symbolically differentiated. Fortunately, it is never necessary to do so. This plot is somewhat crude; we can see the corners. To remedy this we will decrease the step size. We will also insert semicolons after the definitions of X1 and Y1 to suppress the output. 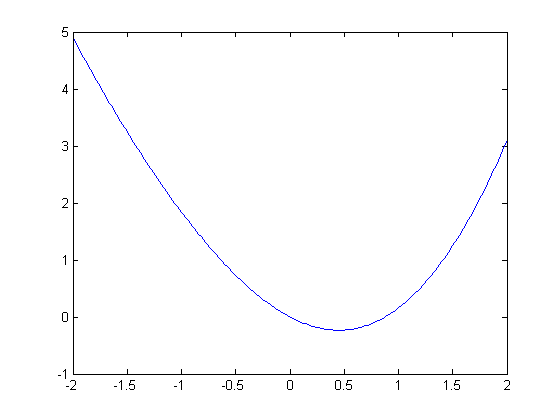 Let the function g be as in Problem 1.
a) Plot g(x) for x between -3 and 3 using plot and a small enough step size to make the resulting curve reasonably smooth. b) Plot g using ezplot. c) Combine the previous plot with a plot of x^2 + 1. Plot enough of both curves so that you can be certain that the plot shows all points of intersection. The plot of f indicates that there are two solutions to the equation f(x) = 0, one of which is clearly 0. We have both solve, a symbolic equation solver, and fzero, a numerical equations solver, at our disposal. Let us illustrate solve first, but with an easier example. Here solve finds all the roots it can, and reports them as the components of a column vector. Ordinarily, solve will solve for x, if present, or for the variable alphabetically closest to x otherwise. In the next example, y specifies the variable to solve for. Notice also that the first argument to solve is a symbolic expression, which solve sets equal to 0. Unfortunately, solve will not work very well on our function f, and may even cause MATLAB to hang. Let us try fzero instead, which solves equations numerically, using something akin to Newton's method, starting at a given initial value of the variable. The command fzero will not accept f as an argument, but it will accept the construct @fun1 (the @ is a marker for a function name) or an anonymous function. Let g be as in Problems 1 and 2.
a) Referring to the plot in part c) of Problem 2, estimate those values of x for which g(x) = x^2 + 1.
b) Use solve to obtain more precise values and check the equation g(x) = x^2 + 1 for those values. We have not yet dealt with integration. MATLAB has a symbolic integrator, called int, that will easily integrate f.
then int will be unable to evaluate the integral. However, if we type double (standing for double-precision number) in front of the integral expression, MATLAB will return the result of a numerical integration. We can check the plausibility of this answer by plotting h between 0 and 2 and estimating the area under the curve. 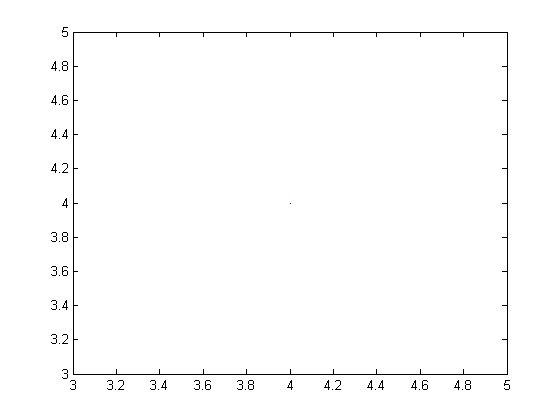 The numerical value returned by MATLAB is somewhat less than half the area of a square 2 units on a side. This appears to be consistent with our plot. The numerical integration invoked by the combination of double and int is native, not to MATLAB, but to the symbolic engine MuPAD powering the Symbolic Math Toolbox. MATLAB also has its own numerical integrator called quadl. (The name comes from quadrature, an old word for numerical integration, and the "*l*" has something to do with the algorithm used, though there's no need for us to discuss it here.) The routines double(int(?)) and quadl(?) give slightly different answers, though usually they agree to several decimal places. Let g be as in previous problems. symbolically, using int, and numerically using quadl. Compare your answers. both using int and double, and using quadl. c) Check the plausibility of your answers to part b) by means of an appropriate plot. 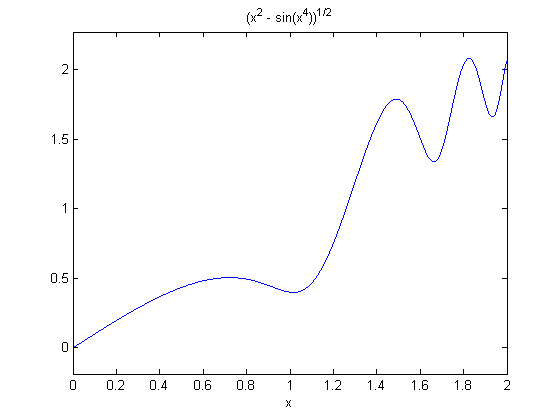 a) Plot f between x = -1 and x = 1.
b) Compute the derivative of f.
c) Use solve to find all critical points of f.
d) Find the extreme values of f on the interval [-1,1]. Hint: solve will store the critical points in a vector, which you cannot use unless you name it. Remember that you also need the values of f at 1 and -1. 2. Find all real roots of the equation x = 4 sin(x). You will need to use fzero. 3. Evaluate each of the following integrals, using both int and quadl.